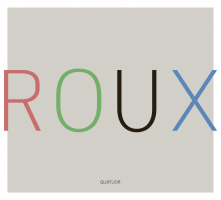 Sebastien ROUX: Quatuor (2011). Brocoli 018 (1 CD) (http://www.brocoli.org/). Quatuor is Roux’s response to Beethoven’s Op. 74 string quartet. The “Harp” has long been part of his life’s diet, and he asked a colleague, Mathieu Bonilla, to arrange 19 nondescript moments (“transition, instability, or stillness”) for flute, clarinet, cello, French horn and percussion (I hear voice as well). These bits were performed and recorded, and this source material was massaged into a four-part electroacoustic work whose movement titles and proportions correspond to Beethoven’s original. The new 36:27 delicately structured, incisive events completely eclipse Beethoven. It is possible to spy the original’s fragments here and there, but for the most part, we hear a Kagel-like non-orchestra whose whispers, distortions and instrumental essences are summoned from the ether creating a warm and domesticated atmosphere. Countless miraculous moments gently surprise, especially in the scherzo (Presto). 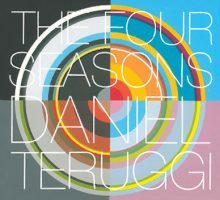 “The Four Seasons.” Daniel TERUGGI: Instants d’hiver (1993); Summer Band (1996)*; Springtime (2013); Autumn Song (2008)**. Juan José Mosalini* (bandoneon), Ancuza Aprodu** (pno). Megadisc Classics MDC 7868 (1 CD) (http://www.megadisc-classics.com/). Teruggi’s lively Four Seasons series gestated gradually, perhaps even reluctantly. Summer Band has a part for bandoneon, and Autumn Song includes piano. The latter reflects the composer’s Argentinian upbringing; in Autumn Song piano and tape are equal provocateurs. Each piece contains many smaller movements which delineate moods and styles even though the total flows as a unity. There are perhaps hidden allusions: In Springtime, I hear the opening chord from Ferrari’s Histoire du plaisir et de la désolation distorted and processed. Later, a sighing woman suggested Danses Organiques. “Allusions to Seasons and Weather.” Peter V. SWENDSEN: Allusions to Seasons and Weather: Before Frozen Fog (2008)1; Bright Days of Little Sunlight (2008)2; Nothing that is not there and the nothing that is (2009)3; Northern Circles (2011)4; four moments near water (2012)5; Sift (2012)6; a sudden change in the consistency of snow (2006)7. Terri Hron1 (recorder), Oberlin Contemporary Music Ensemble2, Jennifer Torrence3 (perc), Dana Jessen4 (bsn), Michael Straus4,7 (sax), Dylan Messina5 (vlc). Oberlin Music OC 14-02 (1 CD) (http://www2.oberlin.edu/oberlinmusic/). Music doesn’t often consider place, but the electroacoustic genre can pin sounds from a particular location and time. Except for the oldest item here, a sudden change in the consistency of snow, in which a saxophone interacts with an aggressive tape, Swendsen works with predominantly subtle field recordings where live performers interact to create expanding soundscapes. Nothing that is not there and the nothing that is (à la Wallace Stevens), for bass drum and live electronics, requires rubbing and tapping the drum over quiet rustling, perhaps leaves being set in motion by the wind. 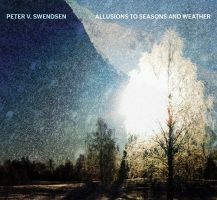 The remainder of Allusions to Seasons and Weather explores details via recorder in Before Frozen Fog, and a modest ensemble including flute, clarinet, violin, cello and percussion in the sparse Bright Days of Little Sunlight. Overall, Swendsen is concerned with subtleties and small flashes of brooding energy. Northern Circles propels a bassoon and saxophone whose lines swirl through delays and processing. Sift is a brief electroacoustic treatment of a poem, and a cello combines with water recorded in Rondane and Bodø (both in Norway) and two places in Prague in four moments near water. 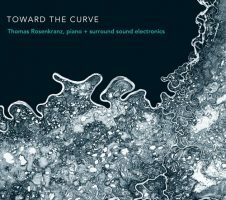 “Toward the Curve.” Thomas ROSENKRANZ: Interlude Nos. 1 and 3 (2013). Peter V. SWENDSEN: A sound does not view itself as thought (2011). Peter FLINT: ElectroSonata: Spontaneous Combustion (2013). Aurie HSU: Lullaby for Morning (2013). Michael KLINGBEIL: Vers la courbe (2012). Pierre JALBERT: Timing and Collisions (1989). Alex CHRISTIE: Three East to West (2013). Tom LOPEZ: The Piper’s Son (2010). Thomas Rosenkranz (pno). Oberlin Music OC 15-02 (1 CD, 1 Blu-ray) (http://www2.oberlin.edu/oberlinmusic/). Offered in both CD and Blu-ray, the listener is encouraged to explore these pieces in surround sound where possible. The composer/pianist’s two own Interludes are a Satie-like cavort with Moorish suggestions (No. 1) and a quasi-minimal, trance exploration (No. 3). Swendsen and Flint utilize pre-recorded electronics containing a compendium of material, including quotations (Wagner, Chopin, et al. in Swendsen). Swendsen’s contribution is frisky and flush with random juxtapositions, whereas Flint establishes a duo as rapid passages interweave with accordion-like sounds and resonant sweeping tones. Hsu finds the instrument’s interior, and Klingbeil explores the tangy buzzing of ring modulation. Christie’s triptych Three East to West charts a journey from nascence towards distortion with a diversion through interior piano sounds. The oldest piece is Jalbert’s, which I probably heard live at its premiere decades ago. Timing and Collisions is deftly concerned with the piano gesture and the responsiveness of electronics to duplicate, repeat and gently distort the piano’s statements. Lopez also visits with pianistic machinations, but prefers abrupt contrasts and startling pre-recorded interruptions. 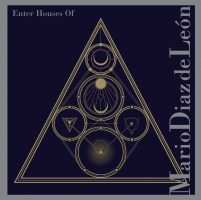 “Enter Houses Of.” Mario DIAZ DE LEÓN: Mansion (2009)1; The Flesh Needs Fire (2007)2; II.23 (2002)3; 2.20 (2003)4; Gated Eclipse (2006)5. International Contemporary Ensemble: Claire Chase1,2,5, Eric Lamb1 (fl, a-fl), Nathan Davis1, Dave Schotzko5 (perc), Joshua Rubin2,5 (clar), Wendy Richman3, Glenda Goodman4 (vla), Justine F. Chen4, Michi Wiancko5 (vln), Adam Friedberg4, Kivie Cahn-Lipman5 (vlc), Jacob Greenberg5 (pno). Tzadik TZ 8065 (1 CD) (http://www.tzadik.com/). Diaz de León advocates a hearty prescription of electronics, which may grumble and whine like petulant electric guitars. There are pauses and unexpected noises which parody a problem with the listener’s playback rig. However, there are also sensitive instrumental moments such as Mansion’s flute duo and The Flesh Needs Fire’s cavorting flute and clarinet. II.23 is for viola and electronics and 2.20 combines string trio with electronics. II.23’s backing uses a wide frequency range including low rumbles that sound like passing airplanes and the clicks and whirrs associated with CD sampling and fast forwarding. Moments of beauty are fleeting. 2.20’s string trio keeps busy, and it’s harder to decipher live vs. pre-recorded and processed elements. Gated Eclipse matches noise with an instrumental sextet. This largest and perhaps most conventional item fuses electronics with the ensemble, whereas, in the more interesting and successful pieces, the real-time processing becomes assertive. “Home.” Angélica NEGRÓN: La Isla Mágica (2012). Florent GHYS: Crocodile (2007). Wil SMITH: Heavy Beating (2007). Jenny Olivia JOHNSON: Home (2007). Lorna DUNE: Home Remix (2016?). 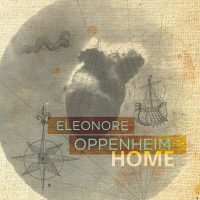 Eleonore Oppenheim (cbs). Innova 929 (1 CD) (http://www.innova.mu/). Oppenheim’s release is on the short end (37 minutes), but the voluble program for contrabass and tape/electronics deftly satisfies. In Negrón’s La Isla Mágica, the bass gently rocks beneath neon-bright electronics. Crocodile involves ambient noise, delays, singing, and a taped story told in French. Smith’s sinister Heavy Beating extracts tapping and other instrument noises, exploring coarser, perhaps more industrial sounds. Home utilizes delays building from held notes and culminating in tremolo, the nearly 10-minute transformation sounding like a train coming up to full speed. The final track remixes preceding content over a steady beat and generic harmonies. In total, the four “original” pieces are closely recorded, demonstrating Oppenheim’s personality. Might the album’s title pun on her name? 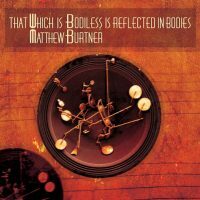 Matthew BURTNER: That which is bodiless is reflected in bodies (2004)*; Siku Unipkaaq (2001); Carving Light from Earth (2012); Stones Touch the Sky (2013); Delta 4 (2009); Delta 5 (2010); Delta 6 (2006); Delta 7 (2011). I-Jen Feng* (perc). Centaur Records CRC 3330 (1 CD) (http://www.centaurrecords.com/). Despite the compelling materials and inventive handling (ice in Siku Unipkaaq, saxophone and its parts in the Delta series, a Tibetan bowl in That which is bodiless is reflected in bodies), it would have impressed more if Burtner had combined several of these étude-like pieces into a larger statement. Presumably, that’s what he has in store, so I will keep an eye out for what comes next. 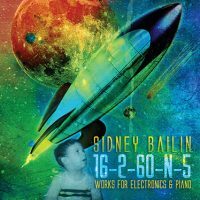 “16-2-60-N-5.” Sidney BAILIN: Space Rocks: Shapes and Shadows (2015)*; Reeds by the Shore (2015); Speak, Child (2015). Karolina Rojahn* (pno). Ravello Records RR7933 (1 CD) (http://www.ravellorecords.com/). Bailin’s elegant handling of material defines Space Rocks: Shapes and Shadows, a trio of piano pieces whose curious titles (Wedges, Cascade, and Dilation) indicate internal procedures which may escape the listener (the first is prepared). It’s possible to hear a change in mood towards the middle in a style between improvised atonal and dissonant jazz. Reeds by the Shore and Speak, Child are tape pieces leveraging canons and gently distorted sources. Reeds employs a synthesized melodic instrument as well as percussion and noise. Speak, Child transforms Bailin’s son’s vocalizations into a mini tone poem. The release’s title defies deciphering, indeed Bailin’s labels and notes grow quickly unhelpful.